So you want to get a wheel? There are so many out there. How do you know what brand to buy or should you get a used one? All spinning wheels are lovely to look at. We’ve seen them sitting in antique shop windows, as decorations in living space layouts, and on ebay! They are featured in movies, TV programs, and in magazines. But which one should you choose? Should it be antique, gently used, or should it be new? My first wheel was an Ashford Kiwi, a beautiful little basic wheel. These are very good beginner wheels. They are totally simple with scotch tension. My request to Santa was for one of the Traditional or Elizabeth wheels. With the advice of the shop owner, a spinner himself, Santa brought me the Kiwi, still in the box! Ashford wheels come as kits. They are made of birch and can be stained any color you might wish. Top this off with very clear instructions for putting them together and you have a really good project. If you get a wheel by mail, it might not be the one for you. You should do some research, find the nearest yarn shop or spinning shop and go try out all the wheels in the shop. Just sit and treadle some for a little while. If there isn’t a shop near you, check for a Spinning Guild near you. See if they won’t invite you to a couple of meetings to spin on their wheels for a bit. Most guilds are looking for new members so are happy to have visitors. If you are determined to have an antique wheel, ask the antiques store owner if you can minutely inspect the wheel he has in the window. Bring along a new cotton or linen drive band, an oilcan, and some fleece. You may have to replace the drive band and for sure you will have to oil the moving parts. Then spin a little fleece to see how the wheel reacts. If the wheel is like most I have seen, it will need some more repairs. This includes the little tab from the footman to the treadle. All that is needed is a new piece of soft flexible leather and a couple of tacks. On Walking Wheels you would need a new drive band and a small tube of Vaseline, the oilcan and your fleece. There are bargains to be had, that’s for sure. Watch the ads in the newspaper, the message boards at the yarn and spinning shops, garage sales, and used furniture sales. You can find some great deals that way. The local spinning guilds usually have a sales list in their newsletters also. But a word of caution: Always tryout the wheel before laying down your hard earned dollars. If you purchase a wheel you can’t get along with, it will sit in the corner and collect dust and cobwebs for a few years before you put it in a garage sale or advertise it on maybe Ebay. No way can I spin on my son’s Indian Spinner. He got a bargain on it from an older lady. He had tried the wheel, loved it and she said it was for sale. It has a heavy cast iron wheel in a rectangular frame. 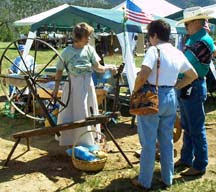 It’s a high production wheel and has a very heavy treadle. I cannot keep the wheel going round! So be warned that people do buy the wrong wheel and then regret it very much as it becomes a dust collector. Any tips on keeping the drive band from slipping? I have the use of an antique Shaker-made great wheel. Everything is there, but I can't get the wheel to actually spin. The drive band just slides around on it.